Treat Snoring and Sleep Quietly, The First Night. The only adjustable anti-snoring mouthpiece with the custom Accu-Adjust System that has helped over 220,000 snorers wake up feeling well rested. Same Day Shipping. Made in USA. 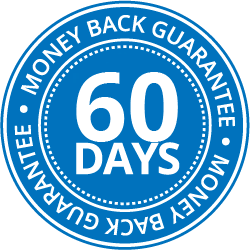 60-Night Money Back Guarantee. 1 Year Warranty. I never expected you would send me a replacement so quickly and free of charge! What a terrific company. I intend to sing your praises from every social media outlet I can! Thank you again! VitalSleep is a custom fitted mouthpiece that holds your lower jaw forward. You’ll get improved airflow into your lungs and quiet breathing as you sleep. Sleeping well is as vital to your health as is water. People who lack restful sleep are likely to have high blood pressure, heart disease, obesity and chronic fatigue. Start treating your snoring problem the first night and enjoy a healthier life. When you sleep your throat muscles relax and between your lungs, nose and mouth. As air travels over the obstruction, the soft tissues vibrate and the sounds of snoring occur. Snoring is annoying and it can make you miserable when you’re awake since it leads to poor quality sleep. It’s a problem that can lead to negative effects on one’s health and in relationships. With the help of VitalSleep to open your airway, you and your loved ones will have more hours of restful sleep. Yes! End My Snoring Problem ? Once you begin using your snore guard nightly, you should experience an immediate improvement in the quality of your sleep. Both you and your bedpartner can expect to sleep more soundly and awaken more refreshed. Order VitalSleep at a single affordable price and a 1 year unlimited warranty. FDA cleared to treat snoring so you can trust it to be safe and effective. It’s made of non-toxic, medical grade materials – FDA 510(K) #K092942. It has helped hundreds of thousands of snorers get sound, peaceful sleep. It’s free of latex and BPA. VitalSleep is made in the USA from 100% USA sourced FDA-approved materials. VitalSleep’s patented Accu-Adjust System allows for personalized jaw advancement for your snoring severity. Boil and bite fit ensure deep dental impressions for a secure and comfortable fit – just like a custom dentist device. Adustable movement – up to 8mm. Advancing the lower tray opens the airway and improves your breathing while sleeping. Choose from 2 Sizes – regular size for men and small for women. The womens size is 10% smaller in size..
Moldable to provide a custom and individualized fit to a user’s teeth for a secure fit. Materials are certified for medical use by the FDA. Avoid cheap “made in China” devices that have no quality assurance or testing. Sleep in any position, breathing through your mouth or nose. Increase durability for long lifespan and over a year of snoring relief.